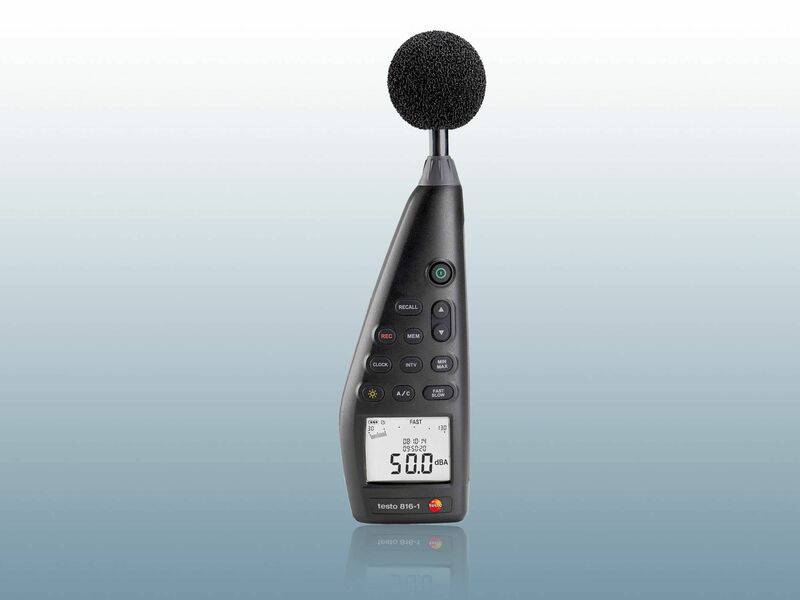 Testo's sound level meters are flexible to use. Count on high-precision measurement results and simple, practical application. For example, in the living environment, building services or on air conditioning and ventilation systems. 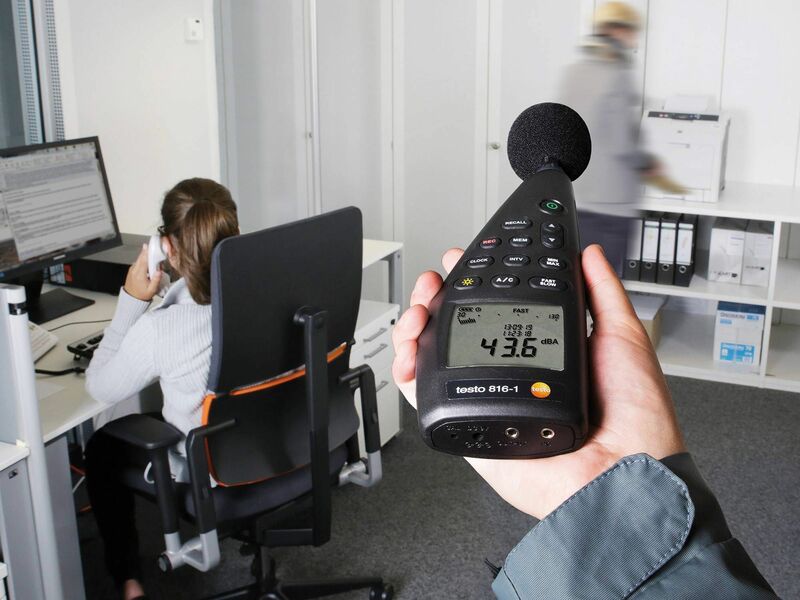 Testo sound level meters are also eminently suitable for workplace and compliance measurements in the environmental protection field or in trade and industry. Standard-compliant and precise sound level measurements. This is how to comply with work and emission protection. It is portable and handy and so can be used quickly and easily. 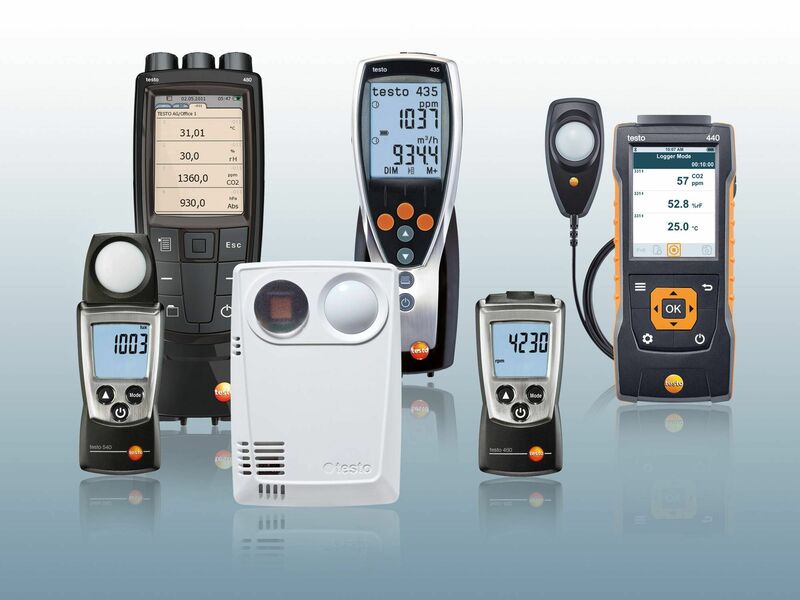 Large variety of models: sound level meter with data logger too for 31,000 readings. Perfect networking via USB. Simply connect to the PC and automatically analyze data. Comprehensive accessories, such as wind protection, microphone, software for data management and long-term measurement, sound level calibrator and lots more. Measure the sound level of air conditioning, heating and combustion systems. Sound level meter certified according to IEC 61672-1. Statutory standards apply to the field of sound level measurement in workplaces and public spaces. Make sure the configuration of your sound level meter is set up for accuracy classes 0 – 2. This enables a higher level of accuracy to be ensured. 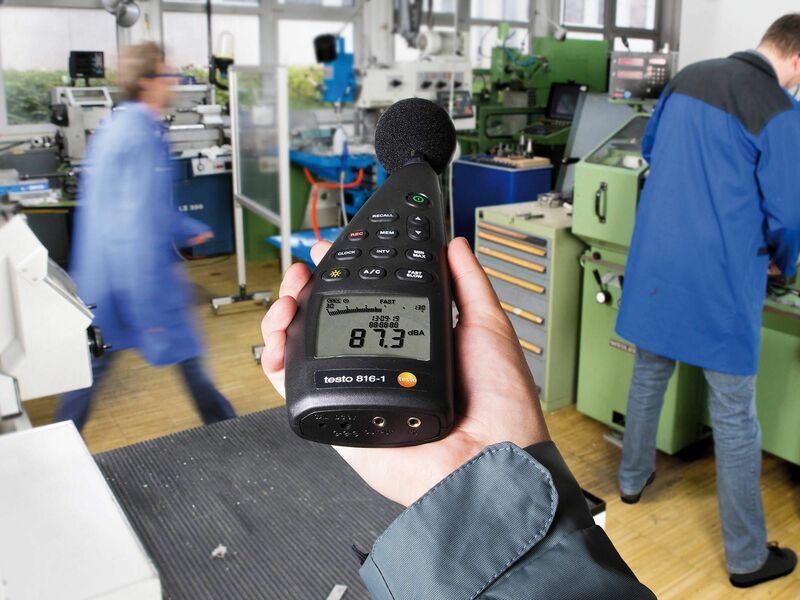 Testo's certified sound level meters are ideally suited for noise measurement in workplaces and public spaces. Would you like to measure indoors or outdoors? 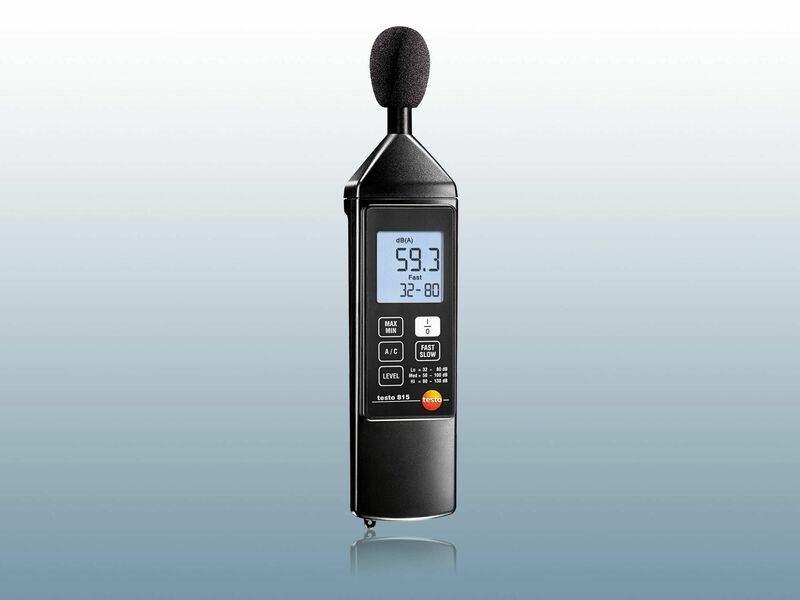 You will find your ideal sound level meter here. Set time weighting: press the SLOW key for noises whose signal only changes slowly in terms of volume (1 s). For noises with sudden sound level changes (125 ms), press the FAST key. Select frequency weighting A/C: for standard sound level measurements, press the A key on your noise meter. Press the C key to assess the low-frequency component of a noise. Align microphone: make sure that the microphone is directed towards the sound source. Sound waves are longitudinal waves which spread out from their sound source in the form of shock waves in solid bodies, liquids and gases. The human ear can hear a frequency of 16 to 20,000 Hertz. Lower or higher frequencies are not normally recorded by a sound level meter. How important is the type of sound source? An increased noise level negatively affects a person's well-being, regardless of the type of sound source. It doesn't matter whether machines, equipment or human voices cause the noise – the sound level meter does not differentiate. Ultimately, the consequences of extremely high noise pollution, which is permanent or regularly recurs (for example in the vicinity of aircraft approach paths), are always the same: massive harm to health. How high are the decibel limit values? Noise-induced hearing loss is top of the list of occupational illnesses. The monitoring of limit values using a sound level meter is intended to avoid any harm to health. But what decibel limit values apply and where? The so-called guideline sound level values and emission values govern this, setting out a range of approximately 55 to 85 decibels as not presenting any health risks. 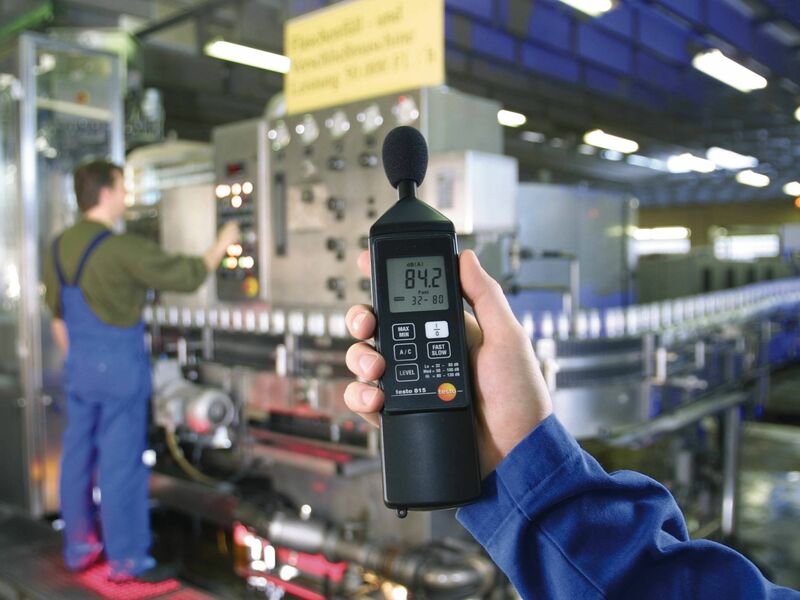 The guideline values differ depending on the workplace: if the sound level meter indicates 70 decibels in a mechanical production facility, that is in the minimum range. On the other hand, in an open-plan office, your sound level meter alarm would go off, as this is an extremely high value there. The recommended guideline value for this environment is 55 decibels. Where does the measurement have to be carried out? Measurement of the volume of burners in heating engineering. Measurement of machinery noise in trade and industry. Noise level measurement at events by event technicians or public authorities. Checking of compressors and assemblies in trade. Where there are complaints regarding living quarters, caretakers can carry out the most important measurements themselves with a simple noise meter. Does your area of responsibility include good indoor air and optimum ambient conditions? Then CO₂ concentration is the measurement parameter which is of interest to you. A Testo CO₂ meter provides you with high-precision CO₂ readings. Carbon monoxide is highly toxic and odourless. That is the reason for recording carbon monoxide reliably with a Testo CO meter, even in the smallest quantities. You will find the solution for professional light measurement at Testo: high-precision lux meters for both simple and professional light measurement. A Testo multifunction measuring instrument with integrated lux measurement offers a wide variety of usage options. A really bright idea! Testo offers a large selection of rpm measuring instruments and stroboscopes for rpm measurement. Find your ideal rpm measuring instrument here.